This month I’ve been joining hosts Girlxoxo, Traveling with T, and Estella’s Revenge for their 4th annual #AMonthofFaves blog event – “a fun way to recap the year that was”. 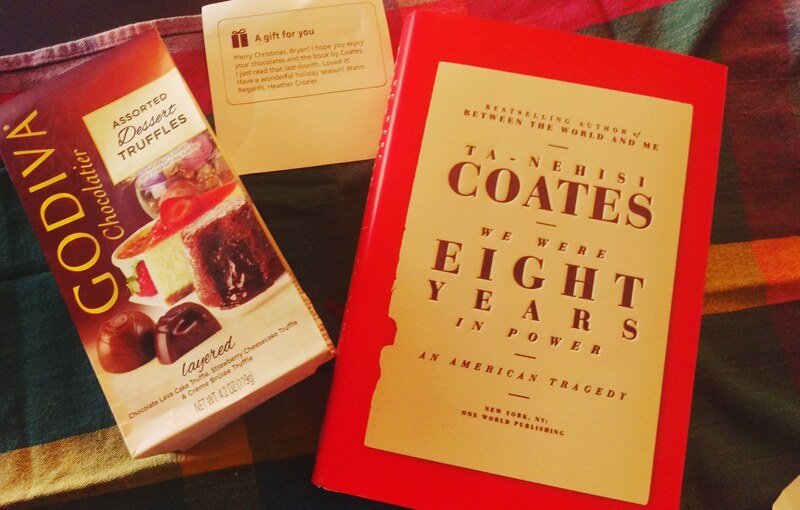 It really wasn’t a complete surprise as I was participating in True Book Addict’s Bookish Secret Santa. However, I forgot after I sent mine that I was receiving a gift too. Thank you to Heather Crozier for the book and chocolate. This morning, Kim and I have been invited to a brunch with Santa by a friend and even though it does involve children and Santa, it also involves free food so we’ll go. Then tonight we are off to a neighborhood Christmas party. Are you getting geared up for Christmas too? How so? Oh wow, a secret santa that’s bookish?! I will have to try and do that next year. Sounds like fun. What a lovely gift! I don’t know if it is the light when you took the picture, but I am thoroughly enjoying how color-coordinated the two packages are. I know. I’m weird like that. I love the idea of spending the month sharing favorites. I completely missed that. Ooh that looks like a great book. I hadn’t heard of it, but I read his other book earlier this year. I have checked this one out a few times, but haven’t read it yet. I think part of me doesn’t want to be depressed…again.